Loewe adds internet radio and 100Hz to its Connect TVs | What Hi-Fi? All Connect sets from 32in upwards are now supplied with the latest generation of the Network Mediaplayer which offers reception of more than 8000 internet radio stations, as well as access to digital photos, video and music stored on a Mac or PC. And the DR+ version includes a Mediaplayer with enlarged 250Gb hard disk drive. Other improvements to the upgraded Connect models include a new chassis, lower standby power consumption, an Eco mode, and three HDMI sockets on the 37 and 42in models. Connect TVs also come equipped with a USB socket, integrated PhotoViewer for presenting JPEG pictures as a slideshow and a VGA port for PCs. A satellite receiver can be retrofitted as an optional extra. 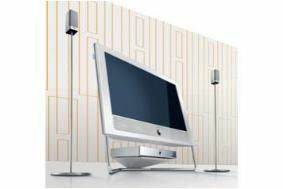 The Loewe Connect range comes in three screen sizes – 32, 37 and 42in – and three colours, silver, gloss white and gloss black. Prices (depending on spec) range from £1470-£2260 for the 32in, £1900-£2540 for the 37in and £2150-£2790 for the 42in. They're available now from Loewe dealers, Loewe Galerie stores in London and Glasgow and concessions in Harrods and Selfridges.